Rockstar says Max Payne 3 is a "more sophisticated" experience that will satisfy the expectations of today's gamers, who are much more demanding than they were when the original Max Payne launched in 2001. It's been ten years since the original Max Payne wrecked New York City in slow-motion and over that decade, an awful lot has changed. 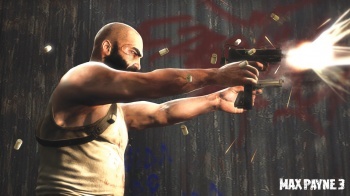 "Both the games and the audiences have become more sophisticated," Max Payne 3 Art Director Rob Nelson told Edge. "Gamers expect a more fully-realized cinematic experience, even if the main mechanic is still shooting. And though this is a more linear game for us, people want to be constantly surprised and entertained in new ways." "So you need a lot of custom setups, the environments need to be varied, and all of that while keeping the gameplay fun and responsive - people have become really specific about how they want things to be controlled," he added. "It's a lot more work!" Improved physics, coming by way of the Euphoria physics engine, is a major focus of that effort. Nelson said the technology makes character reactions more natural and realistic, and gives the studio a much greater degree of control over individual situations. "Euphoria is really helpful in making those situations feel natural, rather than having Max crash into things and ragdoll," he explained. "We can make it feel like he's anticipating an impact before it happens - that's an exciting thing we're working on." Technological sophistication is never a bad thing but will it be enough to satisfy the masses? A painfully long time ago I argued that Max Payne 2 badly underperformed at retail precisely because it was a legitimately mature, sophisticated game, and that mainstream gamers weren't actually interested in that sort of thing. Has that changed? Speaking strictly for myself, I've got my fingers crossed that we'll get to see a little more of that narrative sophistication in the new game, too.